Midweek weddings are becoming more popular with couples who want to save money or avoid having to wait years for their wedding day. It’s true Saturdays may still be the most popular day of the week to get married (closely followed by Fridays and Sundays), but more and more couples are considering weddings during the middle of the week and reaping the benefits. The concept of midweek weddings always has been a part of European tradition, and Manhattan society picked up on it at least two decades ago. The custom has slowly made its way throughout the country. There are a lot of benefits to getting married mid week - Venue availability is probably the biggest. The most popular, trendy wedding venues are now getting booked 18 – 36 months in advance. Wedding vendors typically have less demand during the week as well, so getting your favorite caterer, photographer, DJ, make-up artist or stylists will likely be an easier feat then trying to fight over what’s left of the 52 available Saturday’s that aren’t already booked. A weekday/night wedding can also add sparkle to a routine week. Your guests will know about the date far enough in advance to work out their work schedules. If they want to be there, they will. 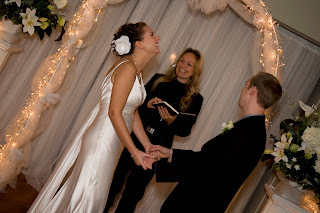 Intimate weddings are really hot right now and are the trend for 2011. Brides are going for a more personal and comfortable approach. It’s all about gathering your family & friends and celebrating your marriage InStyle! “Having a small wedding doesn’t mean having to settle. Thank you Weddings InStyle for giving us the wedding we never knew we could have! We will be forever grateful to you!” This was a quote from one of our most recent weddings. (see website/gratitude section for full quote). So you see, you don’t need to compromise when it comes to your wedding day. The day of the week you choose to get married on doesn’t dictate whether or not you will live happily ever after … well maybe it does, as a little extra money in anyone’s pocket is reason enough to be happy.